In the last 18 months I have seen a significant shift in how participants have used handouts in my customized training workshops. In the past, a copy was printed for each participant and they took notes on the handout during the workshop. Today I see more participants not using paper handouts. Approximately 75% of the participants in my workshops now use the handout in an electronic format and take notes on their laptop or tablet. How much this happens depends on the technical setup and corporate culture. If almost everyone has a portable device (laptop or tablet) and wi-fi is available throughout the facility, it makes it technically possible. This is the situation in more organizations than ever before. The culture must also allow or encourage a paperless environment. If you want to use electronic handouts, here is what I have found works for me. First, with screen sizes becoming smaller I have found that creating the handouts with two slides per page makes the text and visuals big enough to see, especially on a tablet or large screen phone. Second, create the handout as a PDF file so that it appears as you intended and it can be read on any device since the PDF format is a universal format. Adobe offers the Acrobat viewer for free on almost all platforms and it allows you to add comments on the document. 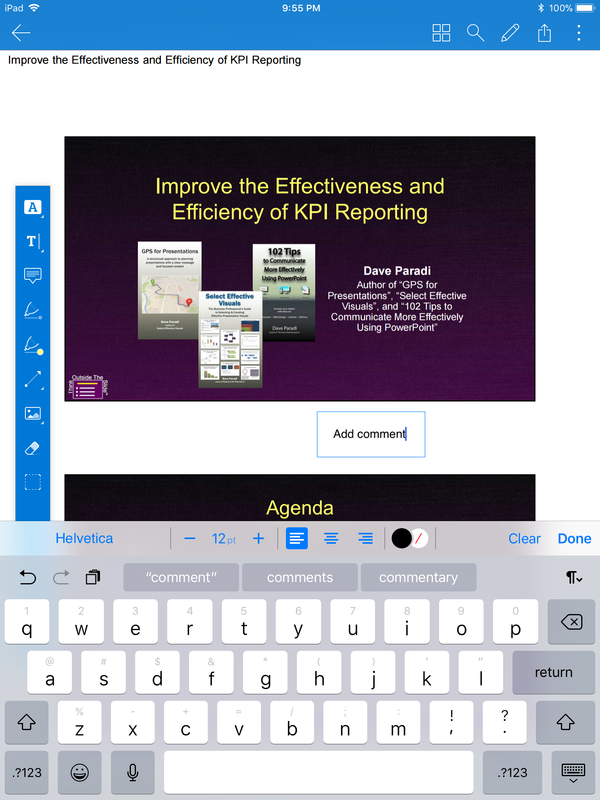 Here is an example of adding a comment using Acrobat on an iPad. Third, decide whether full color or grayscale handouts will work best. One consideration is whether your slide background is white or a darker color. If it is a darker color like the example above, it may not work well for those who want to print the handout as it won’t be easy to write notes on the dark color. If you have a dark background, the grayscale print option will likely work better. A second consideration is whether the color in the slides is crucial to the audience understanding the visuals. If color is important, consider using a white or light background and creating the handouts in color so those using the electronic handout see the colors and those printing don’t use too much ink or toner. When I send the PDF file to my clients I usually suggest that they send the file to the participants only one to two days before the session. If you send it earlier than that, it will likely get lost in the sea of email we all receive these days. Not everyone prefers taking notes on their device so by sending it in advance people can determine whether they want to print the handout or take notes on the PDF version. When analyzing your audience in preparing your presentation, consider what format should be used for any handouts. As you recognize your audience's preference for electronic handouts, use the tips above to prepare handouts that they will find easy to use during the presentation.